PEAK MAGNESIUM is a component of Chlorophyll molecule, thus indispensable for photosynthesis. It is also used by plants for the metabolism of carbohydrates and in the cell membrane stabilization. Magnesium is required to give leaves their green colour. 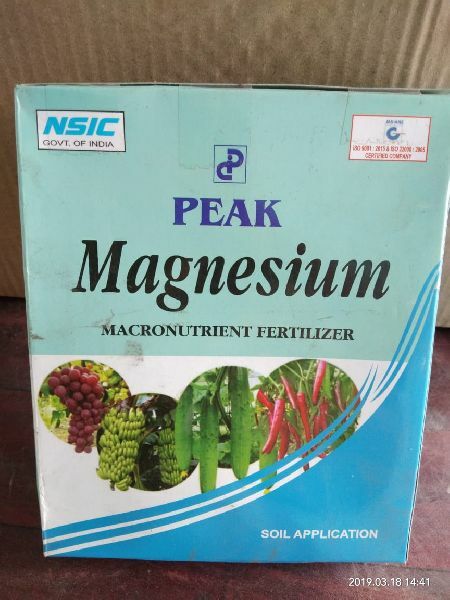 Magnesium deficiency usually occurs in areas of high rainfall and light acidic soils, hence it is necessary to apply Pe.atc Magnesium to fertilize in order to replenish this element and provide additional magnesium for plants. Target Crops : Beneficial for paddy, wheat, corn, potato, tomato, brinjal and green vegetables, also for oil seeds, pulses, tea and other plantation crops and fruits. Dosage and Application : Mix 1 Kg Peak Magnesium with 100 kg farm yard manure (Orgathea) for soil application. Repeat the process in 30 days interval.